The Apple A9X is a high-end ARM SoC (System on a Chip) that was announced in September 2015 in the iPad Pro. Technical details are scarce, what we know is that it is based on the third generation of Apples 64 Bit architecture (Cyclone 3) and manufactured with a "new transistor technology" (14 or 16nm FINFet probably). 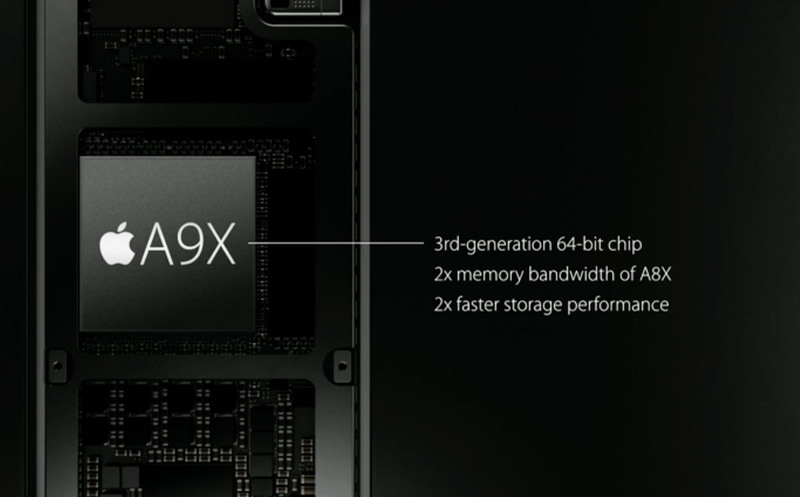 The performance of the A9X did improve a lot according to Apple. The CPU part should be 1.8x faster and the GPU part even 2x faster than the already speedy Apple A8X. Apple even stated in the keynote of the iPad Pro that the performance should be "faster than 80% of portable PCs shipped in the last 12 month". Furthermore the iPad Pro now features a 2x higher memory bandwidth (DDR4?) and 2x faster storage performance. The integrated graphics card will most likely be a PowerVR design again (Power VR Series7? ).